Succotash (from the Native American Narraganset language, msikwatash) is a food dish consisting primarily of lima beans (butter beans) and corn (maize), possibly including pieces of cured meat or fish. This method of preparing vegetables became very popular during the Great Depression in the United States. It was sometimes cooked in a casserole form, often with a light pie crust on top as in a traditional pot pie. In some parts of the American south, any mixture of vegetables prepared with lima beans and topped with lard or butter is called succotash. Succotash is a traditional dish of many Thanksgiving celebrations in Pennsylvania and other states. In Indiana, Succotash is made with green beans and corn instead of lima beans. So here is my take on Succotash. This was my featured entree from last weeks class at the Finishing School. If you can't find fresh okra, I wouldn't suggest frozen-it is soooo slimy! Try substituting it with some zuccini. In a skillet, heat the olive oil and butter together. Cook leek until translucent, add the Lima beans, bell pepper, and corn. Next add the onion, oregano, salt and pepper to taste. Next, in another skillet heat a bit of olive oil. Generously season shrimp and scallops with salt and pepper. 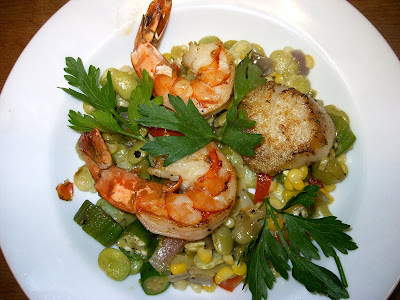 Sear the scallops and shrimp for about two minutes each side and serve hot over hot succotash.